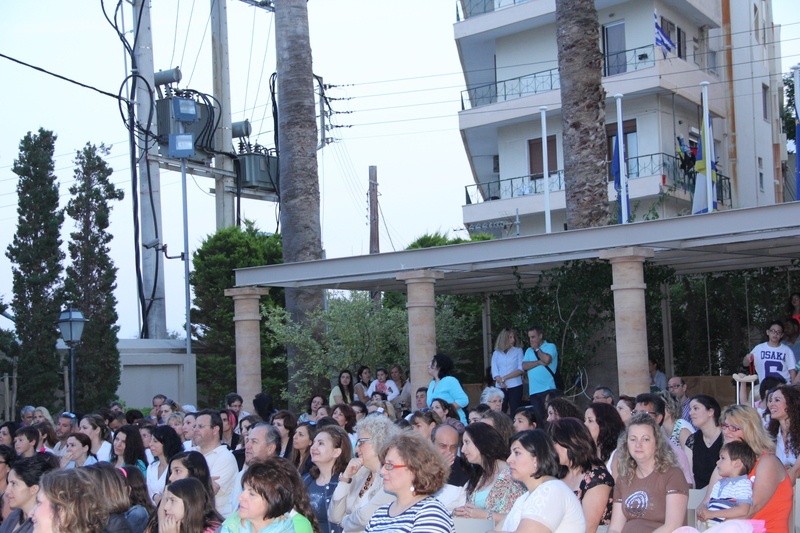 The “Maria Tsakos” Foundation in cooperation with the Directorates of the Primary and Secondary Education of Chios hosted the closing ceremony for the International School Programme “WeCARE”, in which 18 schools, 40 teachers and more than 600 pupils participated. 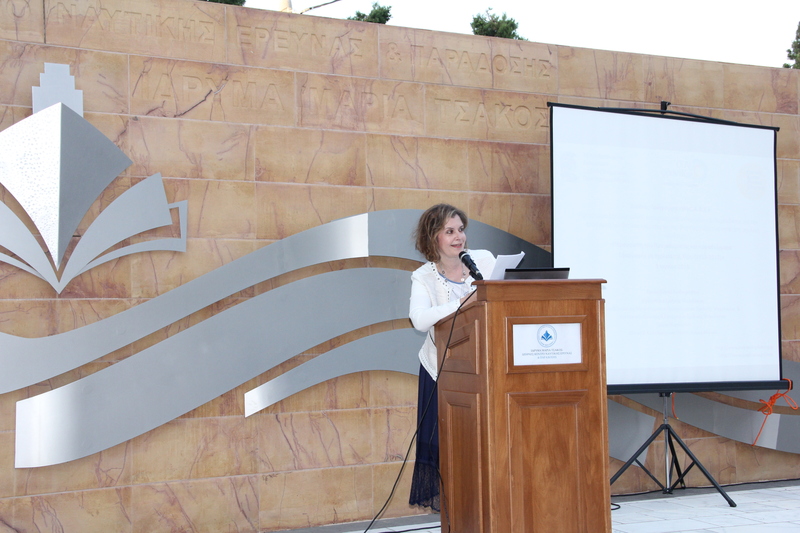 Dr. Chryssi Hatzichrystou, Prof. of School of Psychology, thanked the Foundation for hosting the event and welcomed the participants and the attendees who honoured the event. Mrs. Anatoli Vrocharidou and Mrs. Stella Tsiropina, Heads of the Directorates of the Primary and Secondary Education of Chios, introduced the presentations of the pupils from various schools of Chios. The “WeCare” school programme is a distance specialized training programme for teachers on classroom intervention aiming at the promotion of a positive school atmosphere and mental tolerance of students, the empowering of the team spirit and the development of an international network among teachers, psychologists and students. Το Ίδρυμα «Μαρία Τσάκος» σε συνεργασία με την Α/θμια και Β/θμια Εκπαίδευση Χίου φιλοξένησε την τελετή λήξης του σχολικού διεθνούς προγράμματος “WeCARE”, στο οποίο συμμετείχαν 18 σχολεία, 40 εκπαιδευτικοί και πάνω από 600 μαθητές. Η Δρ. Χρυσή Χατζηχρήστου, Καθηγήτρια Σχολικής Ψυχολογίας, ευχαρίστησε το Ίδρυμα για τη φιλοξενία, και καλωσόρισε τους συμμετέχοντες και τους λοιπούς παρευρισκόμενους που ετίμησαν την εκδήλωση. Η κα. Ανατολή Βροχαρίδου και η κα. Στέλλα Τσιροπινά, επικεφαλείς της Α/θμιας και Β/θμιας Εκπαίδευσης Χίου, συντόνισαν τις παρουσιάσεις των μαθητών από διάφορα σχολεία της Χίου. To σχολικό πρόγραμμα “WeCare” ένα εξ αποστάσεως πρόγραμμα εξειδικευμένης κατάρτισης εκπαιδευτικών και παρέμβασης στην τάξη που στοχεύει στην προαγωγή του θετικού κλίματος και της ψυχικής ανεκτικότητας των μαθητών, την ενίσχυση του ομαδικού πνεύματος και την ανάπτυξη διεθνούς δικτύου εκπαιδευτικών, ψυχολόγων και μαθητών. Τhe inauguration of “Maria’s House – House of Education and Culture”, a Boarding House for Kardamyla high school students will be held on Saturday, September 14th at 12:30. 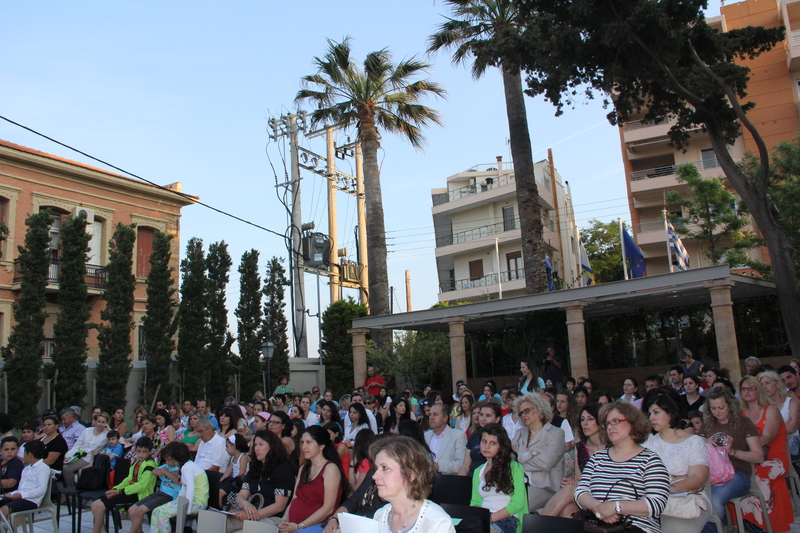 His Eminence the Metropolitan Bishop of Chios, Psara and Oinoussai Mr. Markos will offer blessings. Present will be the Founders of the ”Maria Tsakos Foundation“, the President and Members of the Foundation, local authorities, the participants of the 5th European Coast Guard Forum (which is hosted by the Foundation) and other distinguished guests. 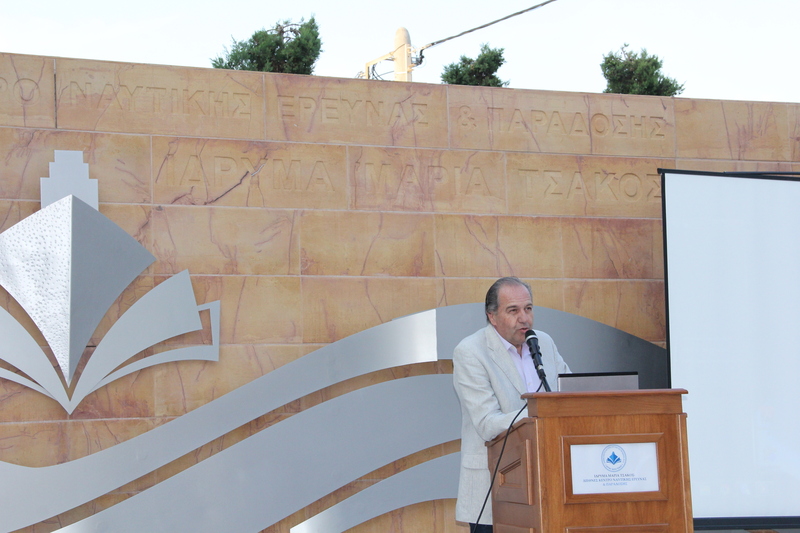 Following the welcome by the Director General of the Foundation, Admiral (ret) Mr. Stavros Michailidis, the Founder Captain Panagiotis Tsakos will give an address. A representative of the Advisory Group of the Boarding House and the incoming student Christos Ioannou will make remarks. The guests will have the opportunity to visit the premises. After the ceremony there will be a small reception. 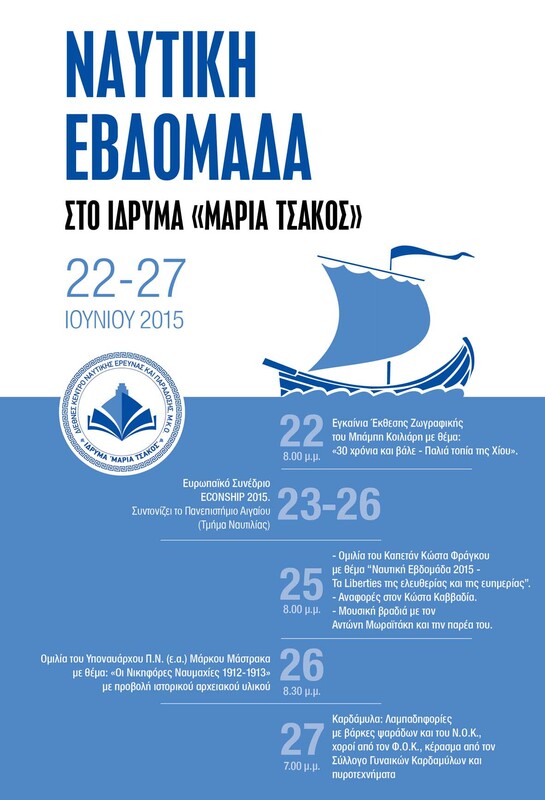 In light of the Maritime’s Labor Convention official entrance into force on August 20th, the Maria Tsakos Foundation organized an international seminar in Athens on May 30-31, 2013 under the auspices of the Greek Ministry of Shipping and the Aegean. The primary objective was to explain MLC’s requirements and implications and provide advise on ways and means for its wide and effective implementation as it covers a wide range of matters of interest to seafarers, flag and port states and labor supply nations. The Seminar was open to representatives of Governments, shipping companies, manning agencies, seafarer organizations, international shipping organizations, maritime universities, academics, students and any interested individual. Following the successful Chios Congress, “Our Response to the Fires”, in October 2012 the “Maria Tsakos” Foundation is sponsoring a National Round Table for Fire Management, to be held in Athens on May 14th, at the Eugenidion Foundation. The organizers also include the Global Fire Monitoring Center and the Greek Agricultural Organization “DEMETRA” with Dr G. Xanthopoulos, a forest fire specialist and scientist and the country’s representative to the United Nations relevant bodies. The main objective of the Round Table is to create an interagency and cross-sectoral Forum with the participation of state agencies and civil society organizations. The Forum’s aim would be to address in a systematic and thorough way the problem of forest and other landscape fires and to elaborate further on an initial proposal to develop a National Fire Management Policy for Greece. Apparently, such a need is long overdue.